ARABOLOGY: Arabic Fusion with Dennis O'Neill Ft. Bushra El-Turk, Tala Tutunji, and Others. Arabic Fusion with Dennis O'Neill Ft. Bushra El-Turk, Tala Tutunji, and Others. 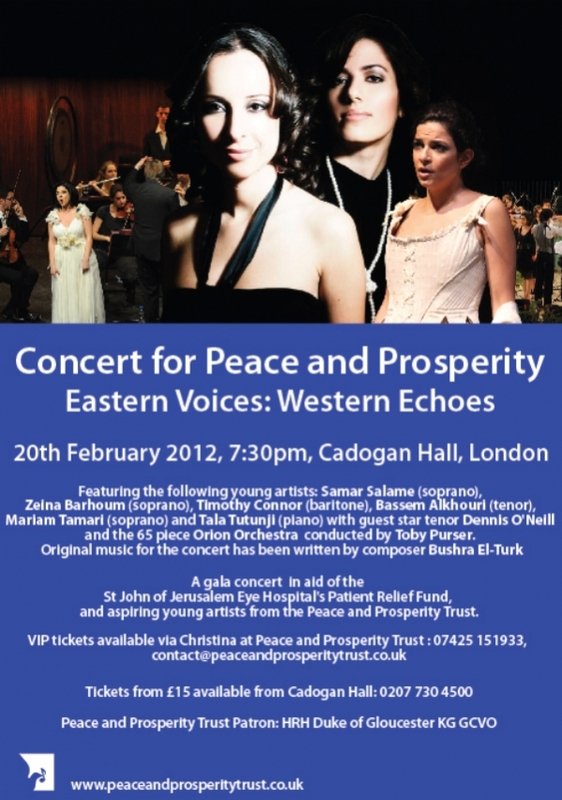 Tala Tutunji (Piano) and Bushra El-Turk (Composer) are among the many talents who are included in this special event/concert which takes place concert on the 20th of Feb, 2012 in England. See details below the poster. Join legendary tenor Dennis O'Neill and a host of leading young Middle Eastern and Western operatic talent for an inspirational evening of music from the Western and Arabic Worlds. The concert also features the premiere of a classical, contemporary work by young composer Bushra El-Turk. The evening is presented by the Peace and Prosperity Trust to raise funds for the ‘Patient Relief Fund’ for St John's Eye Hospital in Jerusalem, and to promote aspiring young artists.